This recipe comes from Mexican Everyday by Rick Bayless. The recipes in this book could mostly be considered weeknight-friendly; no three-hour ordeals. 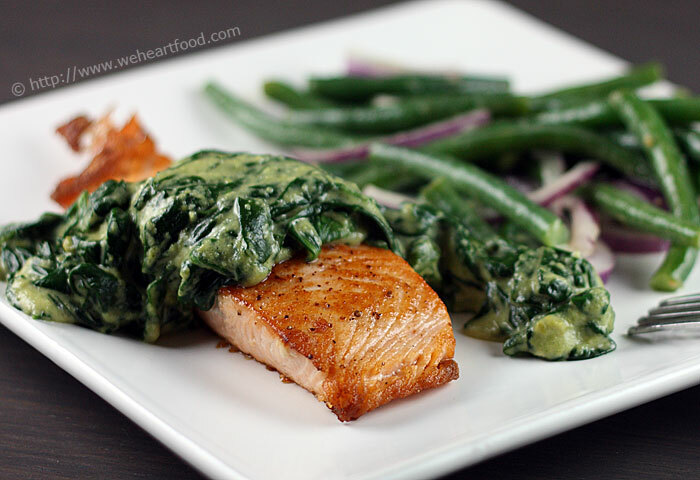 We really enjoyed this dish, where salmon is simply seared and then topped with a mexican-inspired creamed spinach. We served it a simple steamed green-bean and red onion salad. Is there anything better than a seared piece of salmon? I’m sure there is, but I can’t think of anything right now. What do you think of the spinach? You’re right, it just tastes like creamed spinach, but better. You can actually taste the masa harina in the spinach; I really like it. Roast the poblanos over an open flame, turning regularly until blackened all over. Place in a small bowl, cover with plastic wrap, and set aside. Steam or microwave the spinach just until wilted and set aside. Turn the oven on to its lowest setting. In a very large skillet, heat the oil over medium heat. Add the garlic and cook, stirring regularly, until browned, about 4 minutes. Scoop into a blender and set the skillet aside. Rub the skin off the poblano pepper with a paper towel and remove the seeds and stems. Roughly chop and add to the blender, along with the milk and masa harina. Blend until smooth. Return the skillet to medium-high heat. Sprinkle both sides of the salmon with salt and pepper. Lay the fillets in the oil and cook until browned, about 3 minutes. Use a spatula to flip the fillets and cook until the fish just barely flakes when pressed. Transfer the fish to an ovenproof plate and set in the oven. Pour the poblano mixture into the skillet and whisk until it boils, about a minute. Reduce the heat to medium-low and simmer for about 5 minutes, whisking in some more milk if it gets too thick. Season, add the spinach, and stir until warmed throughout. Top each salmon fillet with a portion of the sauce. Lisa made this soup when we were in California during the holidays — orzo, chickpeas, and spinach swim in a simple vegetable broth, topped with garlicky tomatoes and shredded Parmesan. Lisa’s dad liked the soup so much he decided to make it again just a few days later. The recipe is based on one from Heidi’s site, with a few additions. C’mon, no puns tonight please. This is very good Lisa! I’m having more. Awesome! I love the egg whites… they add a neat texture to the broth. I bet this would be good with the kale option as well — if we make this when we get back to Seattle let’s do it that way. Bring the broth to a boil in a large saucepan. Add the orzo and cook until just tender – about ten minutes. Stir in the chopped spinach and chickpeas. Meanwhile, heat the tomatoes, red pepper, garlic, and a splash of extra virgin olive oil in a separate saucepan. Taste for seasoning and salt if needed. Just before serving, slowly pour the egg whites into the soup, stirring quickly with a whisk. Taste and add more salt if needed. 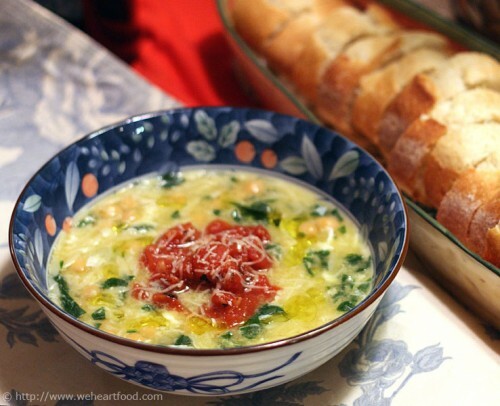 Divide the soup among four bowls, each serving topped with a spoonful of tomatoes, a drizzle of olive oil, and some of the cheese. We received our latest CSA shipment today, and an internet search returned a few promising recipes that would utilize our fresh veggies and wouldn’t require any trips to the grocery store. 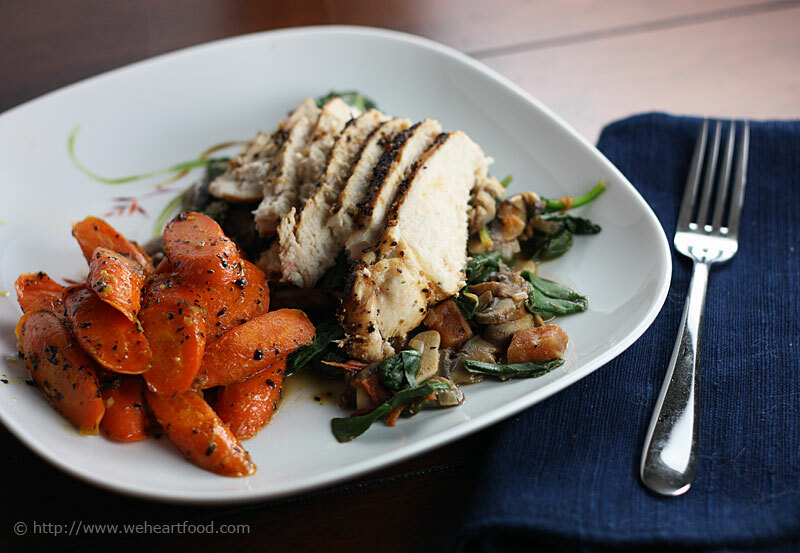 The Lemon-Pepper Chicken over Garlicky Spinach recipe is slightly modified from this one on RecipeZaar, and the carrot dish comes from Quick From Scratch Herbs & Spices. We really enjoyed this combo! 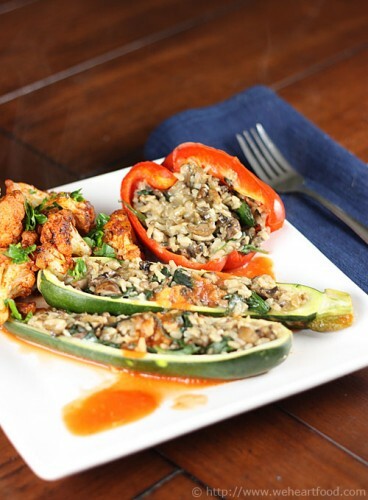 I love last-minute dinner ideas that don’t require me to go out! But you did have to go; we were out of lemons. Shhhh! Don’t ruin the story! The point is we got to use all our fresh veggies. Anyway, these carrots rule. I know it — and I really like this spinach stuff. I think it’s just a tad sweet… maybe needs a bit more lemon juice? Maybe you need to get back to the store? Season chicken breast on both sides with lemon-pepper seasoning. Using a little olive oil or cooking spray, heat a skillet over medium heat. Saute the chicken until done (internal temp of about 165-170). Set aside and keep warm. In the same pan, saute mushrooms, shallot, garlic and tomatoes until softened, about 5 minutes. Add the wine, lemon juice, and 1/3 cup of water. Continue to cook until liquid is reduced to a thin sauce. Add in the spinach, folding in as it wilts. Season with salt and pepper. Place the spinach on a plate and top with the chicken. In a medium nonstick frying pan, heat 1/2 the oil over moderately low heat. Add the garlic, carrots, sugar, 1/2 the salt, the pepper, and the dried marjoram. Cook, covered, stirring occasionally, for 5 minutes. Uncover the pan. Raise the heat to moderate and cook, stirring frequently, until the carrots are very tender and beginning to brown, about 8 minutes longer. Remove the pan from the heat. Stir in the remaining oil and the lemon juice. I’ve had a hankerin’ for lamb lately, so I made this layered dish featuring a spinach and lamb stew over broken toasted pita, covered with a mint-garlic yogurt sauce, and covered with roasted pine nuts! Not the most photogenic of dishes, but we both loved all the different flavors and textures. The recipe comes from Recipes and Remembrances from an Eastern Mediterranean Kitchen. I’m happy about finally making a lamb dish… and this was actually pretty simple. It cooks for a while, but it’s mostly hands-off. This is really good… and the kitchen smells great! I’m gonna happily get “fatta” by eating more of it. I like scooping up the stew with the toasted pita. If “Middle Eastern Nachos” didn’t sound so unappetizing I’d call it that. I just call it delicious. Wash the spinach thoroughly, remove and discard the stems, roughly chop, and set aside. Heat the oil in a heavy pot over medium heat. Add the onions and saute until softened, stirring frequently. Add the lamb and saute, turning to brown on all sides. Add the Mixed Spices, salt, pepper, and water, and bring to a boil. Reduce the heat to low, cover, and simmer 1 hour or until the meat is tender and most of the water has been absorbed. If it has not, uncover and boil until the liquid is reduced. Stir in the spinach, cover, and simmer an additional 10 minutes. Stir in the lemon juice, and adjust the spices to taste. Turn off the heat. In a small skillet, melt the butter. Add the pine nuts and saute until golden brown, stirring frequently. Stir in the red pepper and remove from the heat. To serve, spread pieces of the toasted pita in the bottom of a serving dish. Spoon the lamb and spinach stew over them. 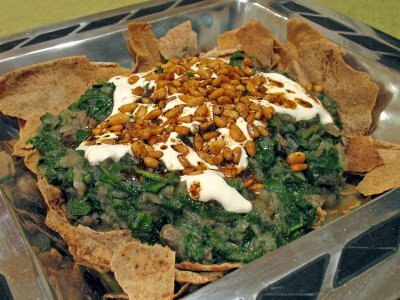 Cover with the yogurt sauce and garnish with the sauteed pine nuts. Dribble the red pepper butter remaining in the skillet over the top.